I am a 6th generation Colorado native, I grew up on the south western slope in Ridgway, CO. I have been professionally guiding since 2015, and have successfully taught many friends and family over the years. I have been fishing since I was old enough to hold a rod. 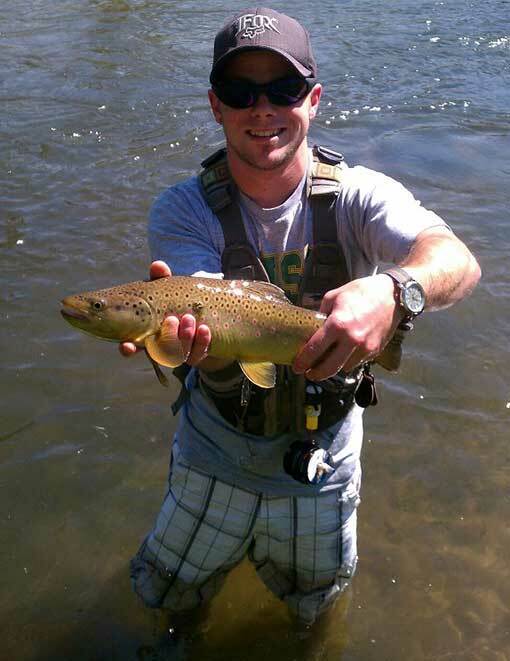 I have been fly fishing for 6 years, all in Colorado. I have fished all over the State and spent hundreds of hours on rivers such as the Eagle, Colorado, South Platte, Big Thompson, Rocky Mountain National Park, Frying Pan, Roaring Fork, Uncompahgre. I have also enjoyed countless small creeks and high mountain lakes. I particularly enjoy pursuing high mountain brook trout. I would love to travel to Kamchatka to fish for Artic Char and huge Rainbows! When I’m not fishing I enjoy home brewing beer, fly tying, playing guitar, pencil drawing, camping, kayaking, and exploring our beautiful part of the state. Watching other people smile and get satisfaction from catching a fish on the fly is just as great, if not a greater a reward as doing it myself. I love that about guiding. I also love teaching and being a steward of the resource in such a rewarding way.